Discover THE SECRET WORLD OF ARRIETTY where imagination comes to life! The studio that brought you PONYO and the Academy Award(R)-winning SPIRITED AWAY (2002, Best Animated Feature) once again delivers a heartwarming tale of friendship and courage in beautiful animation! Featuring the voices of Disney Channel’s Bridgit Mendler and David Henrie and comedic all-stars Will Arnett, Amy Poehler and Carol Burnett, and based on the award-winning novel THE BORROWERS — THE SECRET WORLD OF ARRIETTY will delight families of all sizes! 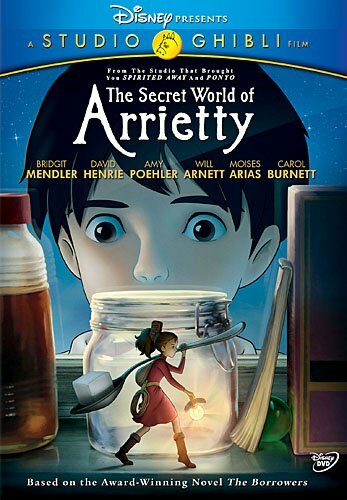 We watched “The Secret World of Arrietty” again this weekend, and I wondered how everyone else felt about this movie. So many of Miyazaki’s films are based on Eastern fables and stories, or stories Miyazaki wrote himself, and they contain Japanese cultural references. They are fascinating, and a window into another world for a California girl like me. Arrietty, on the other hand, is based on the book The Borrowers, written by the English author, Mary Norton, about little humanoid creatures called “borrowers” who live inside human homes… borrowing what they need to survive. Their homes have furniture, food, kitchens and tools that were made from bits and pieces that they found and “borrowed”. They distrust humans, so they stay out of sight, for they know that if they are seen, they have to leave. Arrietty and her family live in a home they’ve created under the floorboards of a home. They go on expeditions to “borrow” cubes of sugar, needles or other important supplies. The “beans”, human beings, don’t realize they are sharing shelter. Arrietty, the focus of the story, is a teen Borrower, living with her parents, and is SEEN on her first borrowing expedition, by Shawn, an sick young man with a heart condition. What happens next? Will the family have to move? Will they meet other Borrowers? Will Shawn reveal their secret? For that you will have to see the film…. On one hand Miyazaki and Studio Ghibli have clearly made this film their own. The animation is beautiful, with magical landscapes that you don’t see in your average animated film. But, as much as this IS a Miyazaki film, it felt wrong to me somehow. What is it about The Secret World of Arrietty that Feels Wrong? Maybe because they used the voice of Bridgit Mendler … I heard (from the other room) too many episodes of “good luck, Charlie” to find her believable as Arrietty. Maybe it’s because I never really cared for the book, The Borrowers. Maybe it felt too Disney-like… happy endings, vapid mother…. While the kids liked this one, It’s not a Studio Ghibli film I will revisit over and over like some of the others…..